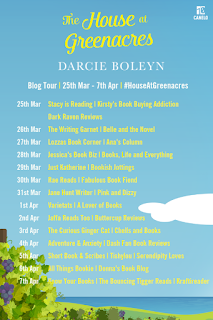 Welcome to my stop on the Blog Tour for The House at Greenacres by the gorgeous Darcie Boleyn! I'm excited to bring you an exclusive extract to read and enjoy! ‘What do you think?’ Holly asked as she held up the mirror. Granny patted her chin-length white hair, freshly washed, cut and blow-dried, and her face broke into a smile. ‘We’re like hair twins now, aren’t we?’ Granny chuckled as she preened in front of the mirror. They hugged, and Holly breathed in the coconut fragrance of the shampoo and conditioner she’d used on her granny’s hair. Her heart was so full of love for this little old woman that she wondered how she’d stayed away for so long. All she could do was try to make up for it now that she was back. They’d decided to do Granny’s hair first, so they could spend the afternoon sorting through Grandpa’s things without having to stop. Holly hoped it would give Glenda the boost she needed before she started the heartbreaking task of bagging up her husband’s belongings. It had also given Holly time to gather her own strength ready to tackle the job. Ten minutes later, they were in Granny and Grandpa’s room, perched on the side of the bed with its faded pink and purple patchwork quilt. Holly had fed Luke, and now he was lying on his play mat on the floor, gurgling up at the zoo animals that dangled over him. ‘With his clothes.’ Granny went to one of the wardrobes and opened the door. She stood there for a moment as if undecided, then reached inside and brought out several shirts and suit jackets, which she carried to the bed. As she set them down, their scent washed over Holly – Grandpa’s cologne, woody and earthy, a fragrance she had always associated with the vineyard because it had seemed to trail behind him wherever he went, a smell that was uniquely his. She ran a hand over the top shirt and found it stiff and starched, exactly how Grandpa liked them. As a child, when he’d picked her up and carried her on his shoulders, she’d wrapped her arms around his neck, feeling his shirt collar pressing against her inner arms. It had been a part of who he was, stiff and formal on the outside, but with a heart of gold. Holly had known that anyone who could reach that heart was very lucky indeed, because Grandpa would always care for those who did. Knowing how much he loved her had made her fear of disappointing him stronger, because there was so much to lose. Emotion surged inside her, so she went out onto the landing and picked up one of the cardboard boxes they’d brought up from the kitchen. Granny had asked Bruce to get them from the barn before he left. Holly stood for a moment, taking slow breaths as she tried to conquer her pain. Being home meant that it was gradually sinking in that Grandpa was actually gone. It felt as though something inside her was coming loose, and if she wasn’t careful, she would completely unravel. When she felt a bit calmer, she took the box into the bedroom and set it on the floor next to the bed. Holly nodded. She removed the shirts from their hangers and folded them neatly before setting them in the box, then did the same with the jackets. It was terribly sad and also quite surreal packing away his things, a final confirmation that he was gone, that he’d never return. But Granny was right: it had to be done. They worked quietly, Granny getting things out and Holly folding and packing, until they’d emptied the wardrobe of hanging garments. The room was filled with Grandpa’s scent and Holly could imagine that he was right there with them. She wondered how her grandmother was finding it, and if she too felt as though her husband was there. ‘How are you doing?’ she asked. Granny turned to face her. ‘It’s difficult. I knew it would be, but … it also doesn’t feel real. It’s like I’m watching a movie and this isn’t me.’ She held up her hands and stared at them. She turned back to the wardrobe and leant forward, pulling out two shoeboxes. Once the first box had been filled and sealed with packing tape, Granny went to the chest of drawers and started removing jumpers and pyjamas. She sorted them into those that could be given to charity and those that were too worn and faded. ‘Dusters and patchworking for these old ones,’ she explained to Holly. As the afternoon wore on, Luke drifted off to sleep on his mat, so Holly picked him up and took him into her room, settling him in the cot. She watched him for a few minutes as his face moved in sleep, his tiny mouth pursing and his forehead furrowing, as if he were reliving the events of the past few days and trying to make sense of them. He was such a gift, such a precious part of her life now, and she knew that she would do anything for him. Her love for him had grown from the moment she’d known she was expecting him, and even though she had considered all the options available to her, she’d known that she couldn’t get rid of him. He’d already been firmly rooted inside her, a part of her, growing there silently in spite of her ignorance of his existence, and as soon as she’d been aware of him, she’d changed her life to accommodate him. Giving birth to him, enduring hours of contractions and days of worrying after his early arrival, had confirmed to her that he was now the centre of her world, and that no one could ever be that important to her. Except, perhaps, another child – should she ever have one. But that wasn’t exactly on the agenda right now, or for the foreseeable future. Luke was her son, her reason, her life, and she’d do everything she could to give him the upbringing he deserved. Back in Granny’s room, she found the older woman sitting on the bed with a small drawer next to her. She was picking things up then putting them back. She looked up when Holly approached the bed. Granny picked up the watch with its brown leather strap and gold-plated back. The face was white with plain black numbers; a smaller circle showed the date, and another one the phases of the moon. ‘Here.’ Granny held it out. Holly touched the winder on the side, then traced her finger over the glass that protected the watch face. To her, it did have value. To her, it represented her grandfather: his efficiency, his work ethic and his desire to see her well educated and well brought up. She fastened the watch around her left wrist, but it slid up her arm, even on the smallest setting. ‘I will do.’ Holly smiled. For all that Granny was a strong woman, she was still old-fashioned in some ways. She knew she’d probably be able to make another hole herself. As she gazed at the watch, though, she made a decision: she would put it away and keep it safe for Luke to wear when he was old enough. It was a thought that gave her comfort. Cufflinks were put into a box for Bruce and other bits and bobs binned or packed for charity, then they carried the boxes out on to the landing and set them in a row. ‘It’s not much for a lifetime.’ Granny stared at them. ‘That’s not his life, though, is it?’ Holly said. ‘No, you’re right. He made your mum, and then she made you, and you made Luke. These things are just … things. His love and his hard work at the vineyard are his legacy, and that will go on through you. We’ll always carry him in our hearts and minds.’ Granny’s voice wavered, and Holly slid an arm around her shoulders. A row of boxes might hold Grandpa’s clothes, shoes and coats, but it didn’t hold who he had been or what his life had been about. They stood staring at the boxes for a while, then Granny turned into her embrace, and Holly held her tight, tears rolling down her cheeks. She cried for her granny, for her grandpa and for herself. Letting go was so hard, and all they could do was try to find comfort from one another and from their memories of a man who had once been the backbone of their family. 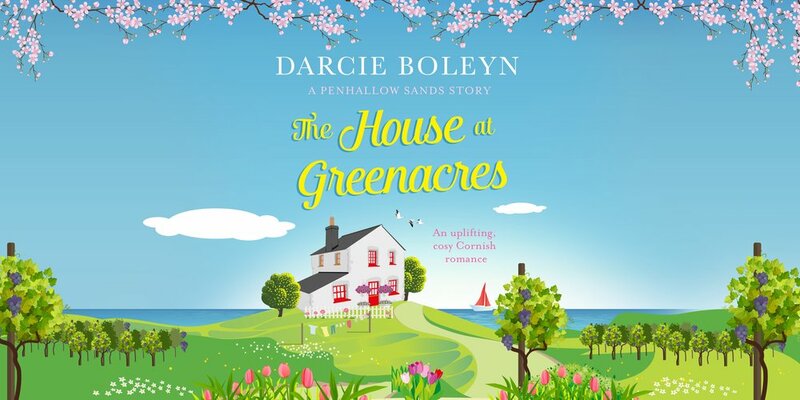 Now that he was gone, Holly wondered what the future held for them all, as well as for Greenacres. It was more uncertain than she cared to admit, even to herself. Thanks to Ellie at Canelo for allowing me to participate in this tour! I can't wait to read the book, it sounds gorgeous, but then, all of Darcie's books are! 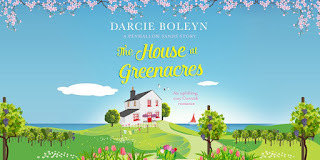 The House at Greenacres is out now from Canelo books!